David Barber. 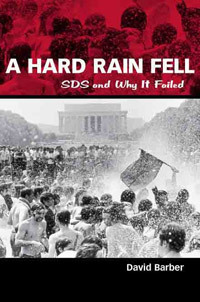 A Hard Rain Fell: SDS and Why It Failed. Jackson, MS: University Press of Mississippi, 2008. Carl Oglesby. 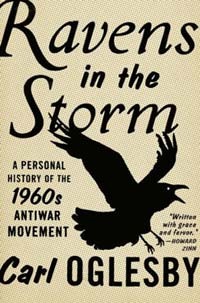 Ravens in the Storm: A Personal History of the 1960s Anti-War Movement. New York: Scribner, 2008. Mark Rudd. Underground: My Life with SDS and the Weathermen. New York: WilliamMorrow, 2009. The inescapable irony of the protests that took place on college campuses in the late-1960s and the early-1970s is that as they reached their largest and most volatile expressions, the largest organization behind such efforts, Students for a Democratic Society (SDS), gave way to extinction. At 12:25 pm on 4 May 1970, National Guard troops at Kent State University opened fire on a group of students, killing four and wounding nine others. Over the next week, students demonstrated on campuses across the country and hundreds of schools were shut down. On 14 May, state patrol officers opened fire on a group of students at Jackson State University, killing two and injuring twelve others. By the time that spring semester came to a close, American higher education had endured a tumultuous period unlike any other in its history. (often referred to as the War Council) in Flint, Michigan in December 1969, SDS’s extinction was the price paid for the birth of the Weather Underground. SDS, an organization that sought to call a generation into more direct involvement in participatory democracy, imploded and the void was filled by a group who, in the words of one of its leaders, was “against everything that’s ‘good and decent,’ in honky America. We will burn and loot and destroy. We are the incubation of your mother’s nightmare’” (Sale 628). While “honky America” certainly possessed significant challenges, how did an organization seeking to increase participatory democracy give way to one bent on destruction? Recent books by David Barber, a participant in SDS; Carl Oglesby, a leader of SDS; and Mark Rudd, a leader of the Weather Underground, provide significant insights yet no definitive answer to this question. However, when read together, they point to a possible theory that may explain not only the emergence of the student protest movements of the 1960s but also this violent turn. Perhaps the student protest movements of the late-1960s and the early-1970s are still too close in time to inspire forms of reflection that transcend anecdote. Historians wading into this epoch were often defined by their own participation in what they were seeking to describe. In their writing, self-clarification appears to be more at stake than historical reflection. As a result, all three of these works seem disconnected from a longer view of the 1960s and thus many of the influences which inspired these protest movements. David Barber, the only one of these three authors formally trained as an historian, may be wrestling with this very reality. In the acknowledgments to A Hard Rain Fell, Barber offers, “I hurt people, in very real, material ways. I did things that I am not proud of having done” (xi). He was “a participant in the struggles of the 1960s and [has], since that time, attempted to make sense of that era” (ix). He does so by arguing that “The New Left’s failure fully to come to terms with its own whiteness finally doomed its efforts” (5). This lack of appreciation for its whiteness is what led SDS to splinter into almost countless groups, the Weather Underground being perhaps the most prominent. For Barber, no other organization “represented the trajectory” of the New Left better than SDS (4). Barber’s history runs from 1965, the year SDS organized its first protest against the growing investment of the United States in the military conflict in Vietnam, through 1970, the year after the fateful meeting in Flint, Michigan. Barber begins his history by arguing that SDS was unable to follow the lead of the Black Power movement—a movement that sought to challenge “a colonial system of white supremacy—both structural and ideological in nature—[that] defined American life and history” (17). Instead, the New Left and SDS, “found its inspiration, its earliest training, and its earliest recruitment as the northern wing of the southern-based black civil rights movement” (16). Barber contends that a liberal ideology of integration was at the center of the civil rights movement and thus at the center of the New Left. What the leaders of SDS did not grasp was that the ideology of the emerging Black Power leadership directly challenged their liberal, integrationist ideology. For Black Power leaders like Stokely Carmichael, the idea that integration was the answer to blacks’ problems was itself a racist idea rooted in the privileged white racial consciousness of the New Left’s leadership. Integration implies that blacks could only improve their condition by becoming more white, by living in white neighborhoods and attending white schools (18). For Carmichael, blacks could not overcome racism until America as we know it––including the liberal, integrationist ideology of the New Left––was completely reborn. According to Barber, the SDS leadership either did not understand—or when it did understand could not embrace—the radical implications of these ideas and thus could not maintain itself as the leadership of the emerging student movement. Barber continues to make his case over the course of five chapters that cover these five years. More topical in nature than anything else, these chapters go beyond Barber’s early concerns about race consciousness to include discussions concerning demonstrations against the war in Vietnam and in favor of the equality of women. In the fourth chapter, Barber makes the transition from detailing the origins of these efforts to an account of the unraveling of the New Left and SDS. In the end, Barber claims that SDS possessed nothing more than “ambivalence” in relation to the Black Power and Black Freedom movements (145). In addition, women continued to play, at best, a supportive or secondary role in SDS. Barber thus concludes his work by arguing that the extremism and violence initiated by groups such as the Weather Underground was the result of the arrogance of a group of young, privileged whites who failed to grasp the implications of their own “whiteness,” and thus felt the need to continuously go to new levels in order to assert their leadership at the front of or perhaps even beyond the New Left. Barber thus contends “They could not be humble foot soldiers of a revolution, but had to take the privileged position that was their birthright as young white people—and this in the name of combating that very privilege” (218). Caught in the center of this transition from the more peaceful means employed by SDS to the more violent means employed by the Weather Underground was Carl Oglesby. While Barber offers a more formal history of SDS’s failure, Oglesby offers a more personal history or autobiography. Such efforts are not new. Both Tom Hayden, author of the Port Huron Statement, and Bill Ayers, one of the leaders of the Weather Underground, have offered their own personal histories of the 1960s. Oglesby’s Ravens in the Storm: A Personal History of the 1960s Antiwar Movement offers a first-hand account of SDS and the student protest movements. He states that his “...aim is to convey the spirit of the time and [his] impressions of the people [he] shared it with” (x). Although Oglesby recognizes that racial integration was part of SDS’s aspirations for a more participatory form of democracy, the bulk of his volume focuses on Vietnam. Oglesby and the majority of the individuals with whom he shared time “recognized a duty—yes, a patriotic duty—to take our beliefs about the war to the larger American public and to insist that the hawks meet us for open debate in the public forum” (xiv). They believed such debate to be essential to the fabric of a democracy. Unlike many of the students who found their way into SDS, Oglesby was a college graduate who served as a staff writer for a defense contractor, Bendix, by day and as a playwright by night. 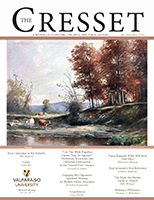 He and his wife, Beth, had a comfortable existence in Ann Arbor, Michigan until Oglesby was invited to attend an SDS meeting by Roger Manela, a graduate student in sociology at the University of Michigan. “And with that, the chain of coincidences that led my family and me [Oglesby] from Sunnyside Street to the thick of the sixties was complete” (36). In June 1965, Carl Oglesby left his job at Bendix and assumed the presidency of SDS. Two months before Oglesby assumed the SDS presidency, the organization had held its first anti-war demonstration, with somewhere between fifteen thousand and twenty-five thousand participants. Oglesby eventually would argue “that SDS needed to get over its fixation with the war and return to its original concerns with racism, white poverty, and the reform of education” (p. 191). However, from 1965 forward, Vietnam would prove to be at the center of SDS’s social concerns. Oglesby’s presidency was defined by his efforts as a centrist to hold together an organization proving more and more prone to fragmentation. By the spring of 1968, he knew that such a task would be impossible. He offers that “Today I look back on this spring of ‘68 as the last time at which SDS might still have gone more or less straight and come out of it all healthy enough to establish itself as a long-term presence in American education” (183). Ironically, SDS’s membership in terms of total chapters in spring 1968 stood at approximately 400. Its number of total members stood at approximately 140,000. Within one and a half years, this very same organization would find itself replaced by smaller offshoots such as the Weather Underground—offshoots that only vaguely represented SDS’s original ideals. According to Oglesby, many of the members of the Weather Underground “had been comfortably raised with a middle-class sense of entitlement, which they brought too easily to their politics” (235). Echoing Barber, Oglesby also acknowledges that the mem­­bers of the Weather Under­ground “believed that SDS was passé and that it was their right and their moral duty to take the step beyond nonviolence to terrorism” (235). Within a matter of months, the student protests of the late-1960s and early-1970s would reach their largest and most volatile forms of expression. By that time, SDS, as a formal organization, was nowhere to be seen. Efforts launched by the FBI such as COINTELPRO certainly played some role in the demise of SDS. However, that demise came more from within the organization than from without. 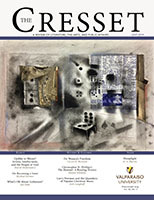 Embodied by the image of Noah’s ravens, Oglesby concludes his personal history by offering that “When we crashed, it was from an enormous height” (317). 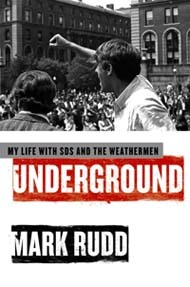 Mark Rudd, the face of the student protest movements which took place at Columbia University in the spring of 1968, is one of the most recognizable leaders of the Weather Underground. In Underground: My Life with SDS and the Weathermen, Rudd details the group’s rise and eventual demise. In this work, we meet someone seeking to rediscover “a voice that I bottled up for two and a half decades” (x). However, the war in Iraq and a recently released documentary simply titled “The Weather Underground” have brought Rudd out into the public square once again. After growing up in northern New Jersey, Rudd enrolled at Columbia as a first-year student in 1965. He joined the Columbia chapter of SDS in 1966, remarking that he found the emphasis on participatory democracy in the Port Huron Statement appealing. With the escalation of the war in Vietnam, SDS “gradually shifted its focus from community organizing around economic issues toward Vietnam” (19). Within the SDS chapter at Columbia, the emphasis on participatory democracy as a means of social creation gave way to an interest in destruction. As a young member of the SDS chapter, Rudd writes that his fellow SDS members “all agreed on one solution, Marxist revolution” (21). In the spring of 1968, Columbia would find itself at the center of one of the first large-scale student protests of this era. At the center of this action was Mark Rudd. Several critical buildings were occupied by the students and university business was essentially brought to a halt. The underlying motivation was the students’ impression that the university was both an implicit and explicit participant in the oppression of people both across the street and around the world. After his expulsion from Columbia, Rudd continued along this trajectory from participatory democracy to revolution by becoming part of the Weather Underground. Inspired by other revolutionaries such as Che Guevara, Rudd “evolved a belief in the necessity for violence in order to end the war and also to make revolution” (132). Rudd contends that by the spring of 1969 the fragmentation of SDS was inevitable. The Weather Underground would initiate their violent revolution in Chicago with the “Days of Rage.” While they sought to recruit 15,000 participants in events designed to bring forward a revolution, in the end only a couple of hundred emerged. Rudd thus concludes that “Street violence is an unsustainable tactic—it makes us too vulnerable and costs too much” (181). The decision was then made that the primary means of initiating this revolution would be the bombing of strategic targets. Rudd would then spend the next eight years of his life underground. He and his colleagues would set off detonations at a variety of symbols of power including a police station, the Pentagon, and even the US Capitol. Rudd points out at the end of his book that “the antiwar movement inherited from the civil-rights and labor movements a highly effective model for organizing—direct engagement between people” (311). One question remains: How could a movement originating in the civil-rights movement, yield to an understanding of destruction as a means of social creation? The answer to this question that we propose is hypothetical at best. The leadership of the Southern civil rights movement, leaders like Martin Luther King Jr. and so many of his contemporaries, possessed an understanding of the good that demanded more than simple integration. 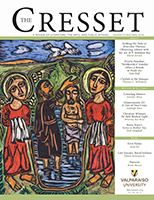 In The Beloved Community: How Faith Shapes Social Justice, from the Civil Rights Movement to Today (Basic Books, 2005), Charles Marsh referred to the understanding of the good that inspired the civil rights movement as one in which people would “come to live together peaceably in beloved community” (1). Martin Luther King’s famous “I Have a Dream” speech evoked a vision of community informed by the content of his Christian faith. “The logic of King’s dream was theologically specific: beloved community as the realization of divine love in lived social relation” (2). Stemming from the inspiration it drew from the civil rights movement, the early protest movements and initial efforts made by SDS were defined by the same commitment to nonviolence. When questioned by Ogelsby’s wife, Beth, about the organization’s commitments, Roger Manela quickly responded by contending “‘SDS is absolutely committed to nonviolence’” (40). However, the New Left was rooted in America’s colleges and universities instead of in the churches which provided the base for the earlier civil rights movement. Oglesby offers that “there was never any doubt [after 1965] that the nation’s schools would have a say in the political evolution of the war” (44). Although church-related colleges and universities would have active SDS chapters, the bulk of the institutions that housed those chapters were largely secular by this point in time. We believe this transition alone was enough to dislodge SDS’s commitment to nonviolence from any larger understanding of the good. And nonviolence as a means of social creation would prove to be difficult to sustain without such an understanding. In essence, perhaps the most volatile expressions of the student protests were the result of a form of liberalism that had reached its limits, one whose secular face emerged at the same time as enormous social strain. While religious liberalism was capable of producing a theory of justice that called into question institutions such as racial segregation and the military-industrial complex, its secular form was unable to cultivate a theory capable of sustaining non-violent efforts to reform or replace those institutions. As a result, the shift from non-violence to violence was all too easy. SDS thus proved to be a secularized way station between the aims of the civil rights movement and the aims of the Weather Underground. Todd C. Ream is the Associate Director of the John Wesley Honors College at Indiana Wesleyan University. Cory M. Sprunger is a student in the John Wesley Honors College.